The Rebel Sweetheart. 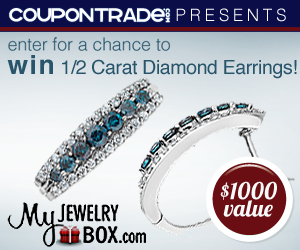 : Sign-Up | Diamond Earrings Giveaway! Great giveaways are meant to be shared. And this next giveaway event is one of them. CouponTrade.com, in partnership with My Jewelry Box, is offering this stunning pair of 1/2 carat (ctw) diamond earrings, valued at $1000. This set boasts the luster of more than five dozen, brilliant cut blue and white stones, delicately crafted from 10 karat polished white gold. Fourteen luminous blue diamonds glimmer alluringly among a bed of fifty-two pristine white diamonds. If you're a blogger, this is a great opportunity to share something fabulous with your readers, and boost your Twitter network at the same time. To sign-up for this event, go here. This event will go live on April 30, 12:01 AM EST.